Yesterday was a bit of a nightmare for AMD. Its key rivals in the CPU and video card markets launched impressive new contenders - Intel unveiled its 45nm Penryn processors, while Nvidia debuted its GeForce 8800 GT graphics card. However, the game is far from over for AMD. Because by the end of November, AMD will roll out a two-pronged response. But will Phenom, its new quad-core desktop CPU, and RV670, a direct response to Nvidia's awesome new GeForce 8800 GT graphics chipset, have what it takes? Let's start with Phenom. The key to its success will be clockspeeds. We already have a pretty good idea of how fast it will be on a clock-for-clock basis. After all, Phenom is based on precisely the same quad-core architecture as the recently-released third generation Opteron processor. Early reviews of that chip make it clear that, by most metrics, Intel's Core 2 CPU architecture retains the edge at any given clockspeed. Especially in enhanced 45nm trim. Put simply, Phenom must hit a clockspeed of at least 3GHz at launch if it's to stand a chance against Intel's new silicon. Of course, it might seem like Intel showed its hand yesterday with the launch of the Core 2 Extreme QX9650, its new 3GHz 45nm flagship chip. But don't be fooled. Should AMD manage to launch Phenom at or above 3GHz, Intel's new 45nm process clearly has clockspeed in hand. The QX9650 consumes around half the power of its identically-clocked 65nm Core predecessor. Intel can easily trade that power saving for higher clocks and more performance. If that happens, the going will be tough for AMD. Its only option will be to take on Intel in price. Indeed, AMD's announcement of a triple-core variant of Phenom suggests AMD already knows this. Odds are, Phenom triple-cores will be priced to outpoint dual-core Intel Core 2s for multi-threaded grunt. As for RV670, things are looking much brighter. No official details have been released. 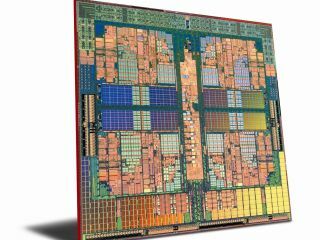 But word is, the new chip is essentially a die shrink of AMD's current top DirectX 10 graphics chip, the Radeon HD2900. However, it's thought that the chip's architecture has been tweaked to address the 2900's key weaknesses, including anti-aliasing performance. If so, it looks like the RV670 could be a corker and should be a great match for Nvidia's new 8800 GT. Look out for full coverage of the launches of both AMD's Phenom and RV670 on Tech.co.uk as the Non Disclosure Agreements fizzle during November.